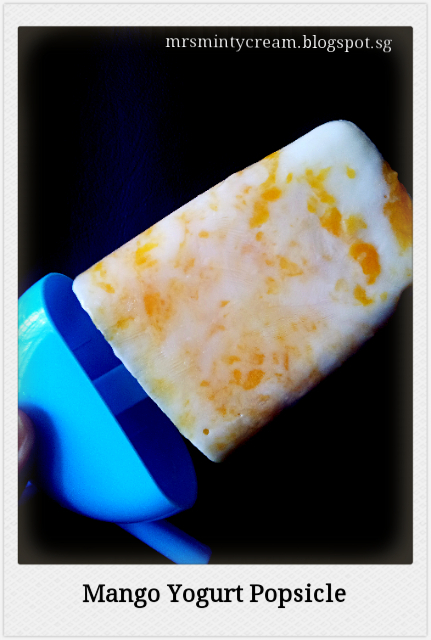 On a hot sunny day, nothing beats having an icy cold popsicle to take away the heat. Don't you agree? During my last visit to the local mart, I came back with tonnes of fruits. There were mangoes, apples, kiwi, oranges, lemons, pears, grapes, banana, strawberries and raspberries. My refrigerator looks like the local fruit stall at the moment. Haha! But that's okay! Fruits are good for us right? With the huge varieties of fruits, how can I not make something which is fruity yet cooling in this hot weather. 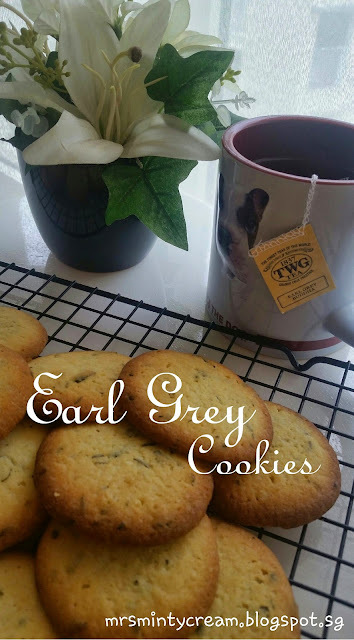 This is a really simple recipe which does not require much work. As long as you have some mangoes and yogurt on hand, you pretty much have everything you need. These were the mangoes I used. As you can see, the mangoes were not fully ripe but that's okay since we are looking for a more citrus taste for our mango yogurt popsicle. A slight tint of sourness will be just fine. 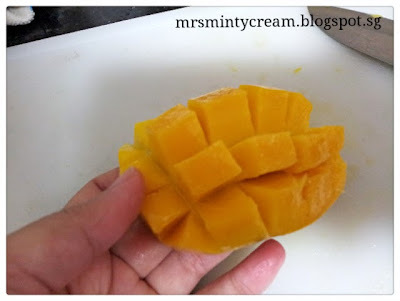 We wouldn't want to be using mangoes that are mushy or have brown pressed marks on them. When I was younger, I used to removed the skin of the whole mango before cutting it up into cubes/slices. The problem with this is that it isn't that easy to remove the whole skin of the mango. I often ended up with mushy mangoes due to over handling of the mangoes. The better way to cut and prepare fresh mangoes for baking / desserts is to make a slice down one side (slightly off the centre) of the mango. After that, make another slice on the other side of the seed of the mango. Then, you may make vertical and horizontal cuts on the fleshy parts to get your mango cubes. Make sure when you are cutting the cubes, your knife reaches the skin but do not cut through it. 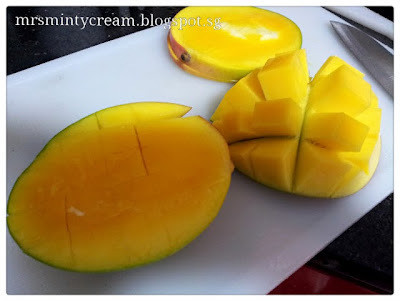 You may then scoop out the cubes of mangoes with knife or a spoon easily. For the remaining flesh around the seed, you can first thinly cut away the skin with a knife just like you are pairing an apple. Then you are remove the remaining flesh around the seed. With these mango cubes, we are really to make our mango yogurt popsicles! 1. Cut and prepare the mangoes. Place the removed mangoes cubes in a bowl. 2. Using a blender, blend the mango cubes and puree until a smooth blend is obtained. 3. Taste the mango puree for sweetness and add the honey, if necessary. 4. In a mixing bowl, fold in the mango puree into the yogurt using a spatula. 5. 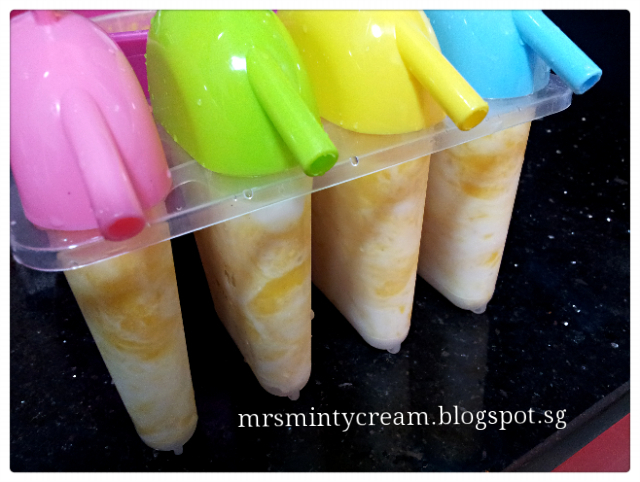 Once the mixture if evenly folded in, pour it into the popsicle moulds. Freeze for at least 2-3 hours until the popsicles are firm. 6. When removing popsicles from moulds, dip the moulds in a bowl of warm water. This will ensure that the popsicles come out smoothly from the moulds.